​Our congregation is welcoming and accessible to all men and women. Our members come from a variety of backgrounds. Some grew up Reform, others grew up Conservative, and others grew up Orthodox. Still others grew up with little or no religious involvement with Judaism. 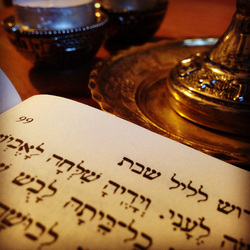 Some know the prayers and blessings from memory while others are entering into Jewish prayer and meditation for the very first time. Some sing along passionately with our prayers while others connect silently with the longings of their souls. Yet we are one people. If you have ever felt “left out” or isolated in the past, we hope you will find that Ahavat Torah is a welcoming place where you can question, learn, grow, and be a blessing. Most of all, you will experience a sense of aliveness and connection to a beautiful and sacred path. As you listen to the singing, chanting, and silent meditations, feel free to engage in your own unique way. And please feel free to join us for the delicious pot-luck dairy lunch that immediately follows the service! In consideration of our members and guests who suffer from allergies, please refrain from wearing even small amounts of perfume, cologne, scented lotions and hair products during services and other Temple activities.